In early March of 1974, Queen did something that they’ve now done 54 times to date. 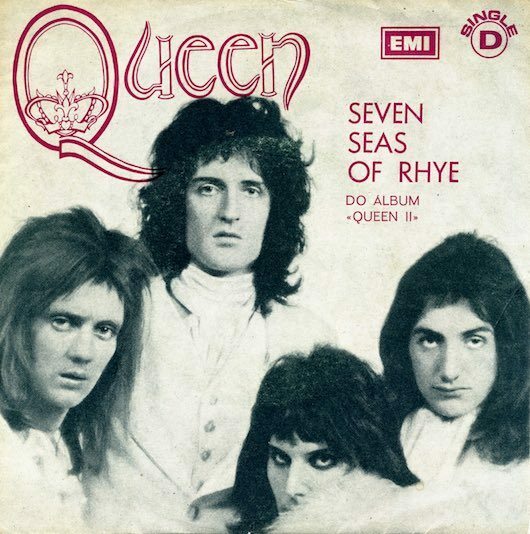 They made the UK singles chart for the very first time, as ‘Seven Seas Of Rhye’ took its bow at a modest chart place No. 45. It was the first of what currently stands at 440 weeks overall on the British bestsellers or, to put it another way, nearly eight and a half years. The song has, of course, taken its rightful place in Queen history, both for being their chart breakthrough and for representing the band at the height of their rocking powers. But when Roger Taylor spoke to Record Mirror in 1975, he revealed that he hadn’t expected it to do well, and that he had thought their earlier, debut single, which wasn’t a chart item, would perform better. As ‘Rhye’ made its chart debut, the album it was on, Queen II, was new in the shops, and the single and LP would climb the UK charts in tandem. After that No. 45 entry, ‘Seven Seas’ climbed to No. 30 and then No. 15, where it seemed to have stalled before it rose again, peaking at No. 10 in mid-April. Queen II would within two weeks it was in the top ten, for a No. 5 peak. Queen’s sales momentum was now well and truly under way. “Seven Seas of Rhye” was primarily written by Freddie Mercury, with Brian May contributing the second middle-eight. The song is officially credited to Mercury only. A rudimentary instrumental version appears as the final track on the group’s debut album Queen with the final version on the follow-up Queen II , The completed version served as the band’s third single, It was publicly premiered when Queen were offered a sudden chance to appear on Top of the Pops in February 1974, and was rushed to vinyl two days later in February. It became their first chart entry after gaining airtime on BBC Radio 1. In 1977, Queen were the champions. They came to rock you. While much of the music press was getting in a lather over punk and predicting the death of classic rock (wrongly, as it would turn out), the real headlines were these: Queen had a new album out. They’d penned two juggernaut songs – alongside a host of other genre-hopping tracks – and, in News Of The World, they were poised to break America. Forty years after Queen truly elevated themselves to arena-filling live act, “News Of The World” is set to reappear in a 40th-anniversary box set edition spanning one LP, three CDs and a DVD, and featuring previously unheard recordings that will rock you all over again. Due for release on 17th November, the original News Of The World album is bolstered with a whole CD of previously unheard takes from the recording sessions, making up an alternative Raw Sessions version of the album. Among the surprises on this disc are a recording of Brian May’s ‘All Dead, All Dead’, sung by Freddie Mercury and only ever heard by the band’s closest confidants; an unedited version of ‘Sheer Heart Attack’, with its intro and ending fully intact; and another unreleased full-length recording in the shape of one of the album’s indisputable classic cuts, ‘We Are The Champions’. With a host of other differences between the Raw Sessions and the released News Of The World album versions, this disc marks one of the first times that Queen’s archives have been opened to such an extent – and it reveals plenty more jewels in the band’s crown. One of the most stylistically varied albums in Queen’s wide-ranging body of work, News Of The World itself appears in the box set as both the 2011 CD remaster and also a band new Pure Analogue LP cut, taken direct from the unmastered analogue tapes and housed in a replica of the original 1977 artwork. A third CD offers further rarities, among them a seven-song BBC radio session, instrumental backing tracks and live recordings, while a 60-page booklet and a DVD of the unreleased Queen: The American Dream documentary take further in-depth looks behind the scenes of a phenomenal year in Queen’s truly regal history. Tracking the band both on tour and in the recording studio, Queen: The American Dream in particular captures the group as they were poised to take over the US – and further stake their claim as one of the world’s greatest rock bands. 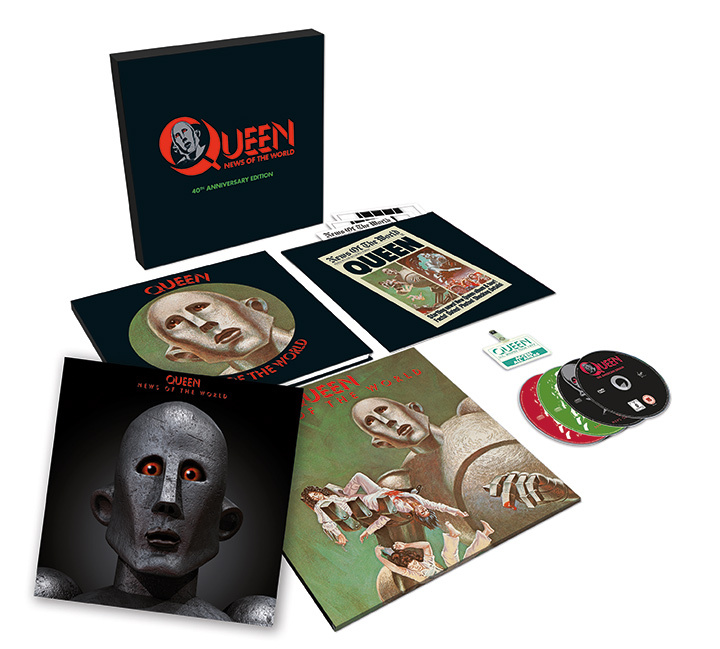 Queen’s News Of The World: 40th Anniversary Edition box set is due for release on 17 November. A limited edition print is available for orders placed through Queen’s online store. The 40th anniversary News Of The World box set is issued next month and the band have just made available a couple of previously unreleased outtakes from the ‘Raw Sessions’ disc (CD 2 in the box), namely We Will Rock You and We Are The Champions. Decades ago, Queen‘s “Bohemian Rhapsody” posed an existential question: “Is this the real life? Is this just fantasy?” So, what better soundtrack for a cool new virtual reality interactive called the Bohemian Rhapsody Experience?. Queen have paired with Google Play and Enosis VR to create this 360-degree 3D journey, which runs on both iOS and Android. Check it out at the official site, where it can be downloaded via Google Play or at the App Store. You can also watch the interactive through Google Cardboard or as a 360-degree video on your mobile device. Want to find out more? The above video takes fans on a behind-the-scenes tour to see how the Bohemian Rhapsody Experience was created. Take a behind the scenes look at a virtual reality experiment from Google Play and Queen. The Bohemian Rhapsody Experience offers a journey through Queen frontman Freddie Mercury’s subconscious mind and recreates the sensation of being onstage with the band, with visual and audio elements that respond to your movements. The content is also available as a 360 degree video for you to experience even if you do not own a Google Cardboard. Queen in concert at The Hippodrome, Golders Green, recorded on October 20th, 1973 by BBC Radio 1 for their weekly In-Concert series. Queen came along at a time when seemingly everything in Rock was up for grabs – changes were all over the place. The 70s were the decade of Prog, Hard Rock, Country-Rock, Glam, 50s Revival, Disco, Punk and New Wave (and probably several more that flew by). A lot of musical changes were crammed into the space of 10 years, and the business itself was changing considerably during those ten years. Rock had grown up – was now a huge business; it was something that entertained corporate stature. And even though it was still a bunch of kids getting together in a garage and working on music and struggling to make it, it was now big business – very big business. Queen came along, following in the footsteps of David Bowie, Mott The Hoople and Glam in general. However, they represented a different approach as to how music and bands were looking at business and their careers. In the 1970s many bands were setting up their own production companies and in some cases their own labels. It was a way of maintaining artistic vision and retaining control over what they were putting out. Quickly fading were the days when an artist or band would be signed to a label and have three songs cut; one for the a-side of a single, one for the b-side and one extra in case neither worked out. Based on sales and how that single did, they would go on to the next step and record an albums worth of material (sometimes quickly, which meant a lot of “filler” was involved). It was pretty much to the dictates of the label – and some labels were unscrupulous (and still are, according to quite a few). The business was now evolving into an atmosphere where Managers and Production companies were beginning to call the shots. In the case of Queen, they were aligned with producer Roy Thomas Baker and Trident Studios; a relationship which was the catalyst and model for many other artists to follow later on. Baker and Trident negotiated what at the time was barely heard of – especially for a new act – leasing masters and negotiating with labels in other territories to release their albums. Baker, Trident and Queen were in a position, not only to call the shots, but to preserve their artistic direction and vision – something previously known in the world of Music as a crapshoot. But the fact that Queen were high-energy and coupled with excellent production, made them an instantly accessible band. I remember when their debut album was issued in the U.S. via Elektra (they were on EMI in the UK), it succeeded in dropping jaws and creating a lot of excitement. This concert comes just about two months after that debut album was issued and you get the unmistakable feeling something is starting to happen. By 1975 however, Queen had become major. And thanks to their 3rd album Sheer Heart Attack, they were became international successes. Remember, this is all before A Night At The Opera, the pivotal album which turned them into superstars and filled arenas to overflow. This concert finds them heading in that direction. Propelled by the soaring vocals of Freddie Mercury and the virtuosic efforts of Brian May, Roger Taylor and John Deacon. The story of Queen is not unknown to fans – the story of Freddie Mercury and his battle with AIDS took a ravaging disease and brought it closer to home. But that’s all in the future – here we are, and it’s 1973. The Hippodrome is playing host to Queen and BBC Radio 1 are preserving it all. You get to listen to it now and be reminded or become introduced to one of the extraordinary bands of the 1970s and hear why they became household names.